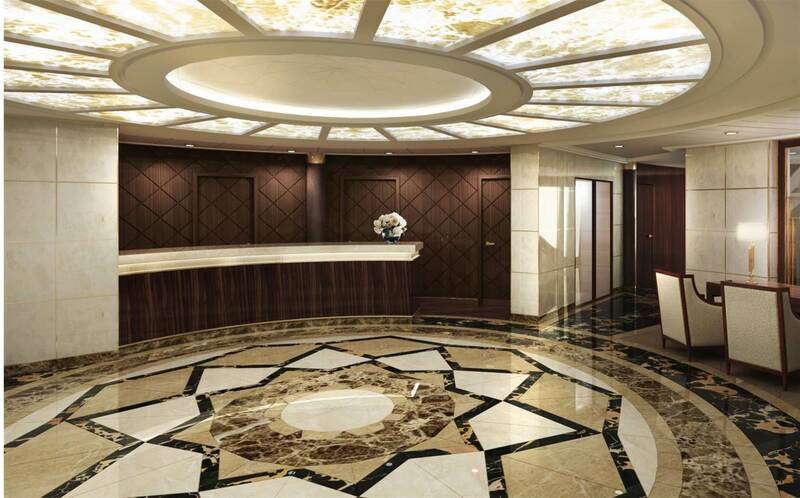 The public spaces and suites to be refurbished will feature the same elegant style and indisputable attention to detail famously featured on Seven Seas Explorer®, providing guests with a consistent look-and-feel, no matter which ship they choose to sail on. The two-year $125 million investment includes significant renovations of most public spaces along with a complete redesign of several suite categories. Seven Seas Navigator, carrying a mere 490 pampered guests, will be the first to receive this luxurious upgrade, followed by Seven Seas Voyager® in late 2016 and Seven Seas Mariner® in the spring of 2017. Penthouse, Concierge and Deluxe Suites: The largest collection of suites onboard the ship will receive a luxurious new look. The contemporary design accentuates the spaciousness of the suites. Reception Area: Guests’ first exposure to the renovations will take place in the completely-redesigned reception area, where contemporary and classical design elements seamlessly meet. Compass Rose: The ship’s flagship restaurant will be grander and more resplendent than ever before. La Veranda: Effortlessly chic, La Veranda will feature a fresh and airy design that is accentuated by a wealth of natural light from floor-to-ceiling windows that encircle the restaurant. Galileo Lounge: True to its name, the Galileo Lounge on Deck 11 conveys a celestial feel, beginning with its tempered glass double-door entrance trimmed with an abstract design reminiscent of the solar system and featuring a decorative sun-shaped handle. Navigator Lounge / Coffee Connection: By day, these intimate Deck 6 venues – connected by a central walkway – are bathed in natural light from a bank of windows overlooking the sea. Library: The bright yet intimate library exudes comfort and charm. From its faux fireplace to cream-colored sofas resting atop a glistening marble floor, the room is reminiscent of a library found in a residential estate home.